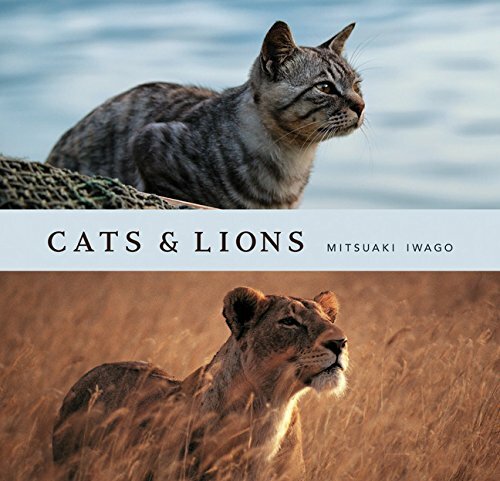 Remembering this incident, I was drawn to reading Cats & Lions by award winning wildlife and nature photographer Mitsuaki Iwago. Iwago tells us that “Cats are small lions. Lions are big cats.” In a series of beautiful and distinctive photographs, Iwago cleverly sets out the lives of domestic cats in urban areas and African lions in the wild, side by side. He reveals the similarities between the two species and captures the natural beauty of the different environments in which they live. He compares these cats’ musculature and movement, when walking, feeding and hunting. We see them when they are at rest or gazing into the distance, thinking who knows what and scenting the air. Other outstanding photographs focus on the close bonds between feline families – parents with kittens or cubs, grooming each other and playing together. Iwago’s work is atmospheric, which is partly due to the amount of detail the he captures in both the subjects and backgrounds of his photographs. Colours are intense and the lighting stunning. You can almost feel the snow falling, hear the murmur of the wind moving through the grass of the savannah, or anticipate the sound of thunder in the distance, preceding the rain. I think that Iwago aims to create an emotional response from the reader. His photos invoke happiness, especially if you like cats. They will make you happy but also perhaps, a little sad. Iwago explains in his introduction to Cats & Lions that “The Lion is a wild animal and does not have an easy life.” His images show us that while lions are supremely adapted to their environment, they must compete and hunt for food. Their only shelter from danger and the harsh elements of heat, drought and driving rain is the long grass and some sparse acacia trees. You can reserve Cats & Lions through the One Card Network library catalogue, or enquire when you visit the Library. Mitsuaki Iwago is also the author of Curious Cats, In the Lion’s Den and Mitsuaki Iwago’s Whales which are available through the One Card Library Network.